For the past few months I’ve been taking a distance learning course at WPI called “System Dynamics Foundations: Managing Complexity”. The course covers a broad range of topics about the system dynamics methodology and how it has been applied in the real world. One of the things I really like about the course is the different perspective the instructors bring to the table (or in this case my computer screen.) Last week’s lecture focused on three different styles of system dynamics modeling – Causal Loop Diagrams (CLDs), insight-based models and calibrated models. While both instructors agreed there is value in all three approaches to dynamic modeling, there was clearly a difference of opinion about what is required to actually DO something with a proposed solution to a problem. The topic got me to thinking about the types of STELLA and iThink models that are being built and how they are being used to DO something about real world problems. I would guess that the majority of the models fall into the insight-based category. One of the reasons we put so much effort into creating communication features in our software is so that those insights can be shared and discovered by others. The “ah-ha” moments that come from experimenting with simulations are often a great vehicle for getting conversations going about a particular issue and discussing possible solutions. A great example of an insight-based model is the housing supply and demand model that we recently published to the web using isee NetSim. The model was created by our Director of Product Development, Karim Chichakly, to demonstrate how some of the new capabilities in Version 9.1 can be used to understand the dynamics behind the 2008 collapse in the US housing market. The model provides some background information about the factors leading up to the collapse, including subprime mortgages and the government practice of using interest rates to control inflation. 2008 saw the biggest collapse in the financial system since the Great Depression. The trigger for this collapse was a large number of defaults on so-called subprime mortgages. Could this crisis have been predicted and perhaps averted by examining the combination of the government’s manipulation of interest rates and the rise in subprime mortgages by banks allowed by deregulation? Before you delve into the simulation, I recommend tracing through the causal loop diagram. Click the link on the first screen of the online model. 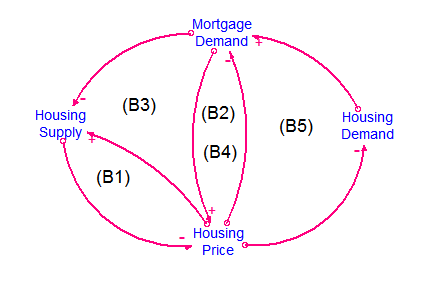 Tracing the CLD will give you a high-level understanding of the relationships between the key components of the underlying model – housing supply, housing prices and demand for both housing and mortgages. Stepping through the feedback loops really helps to explain the situation in very operational terms. And it’s much easier to understand what’s happening when you’re dealing with one loop at a time. It can get pretty complicated if you try to digest all that is going on at once. That’s why building a story of the model before you simulate is so helpful! You can also view the stock and flow diagrams for each model component or module. The simulation allows you to play with interest rates, just as if you are the Chairman of the Federal Reserve. It also provides a “Mortgage Deregulation Switch” so that you can see the impact of banks relaxing requirements and allowing more people to qualify for mortgages. I was surprised by the affect relaxing mortgage requirements had on prices and had one of those “ah-ha” moments when I tried to raise interest rates to control inflation. Try it yourself and see what happens to mortgage defaults! The learning that comes from experimenting with insight-based models can be pretty infectious. When you’ve discovered how something really works, don’t you want to share it with a friend? isee NetSim makes it possible to share your discoveries with just about anyone. 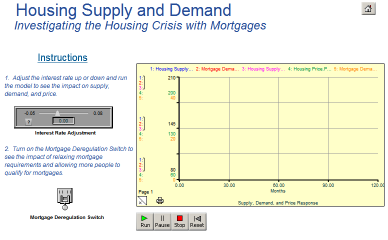 The housing supply and demand model is an example of sharing insights about the dynamics of the housing crisis. After you run a few simulations, let’s get the conversation going about potential solutions. 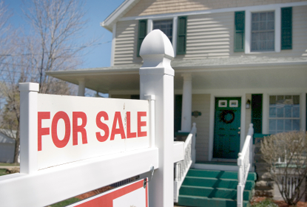 What do you think of the government bailout policies or the millions of people defaulting on their home mortgages?